Auto Parts Warehouse is one of the top car parts distributors in USA and it has a lot of different parts for all vehicles. They have everything from Acura parts to Volvo parts and vehicles in-between. Auto Parts Warehouse has auto parts of different brand names, including Bosal, Standard, Reese, Bosch, and many more. There are any parts needed available online like ball joints, control arms, batteries, turn signal assemblies, toolboxes, ignition wire sets, and ignition switches. Also other items to dress up the car are available like car bras, car covers, and air deflectors; they all could be found easily on the Auto Parts Warehouse site. There are many benefits to ordering auto parts online from Auto Parts Warehouse. One of the best benefits is that they ship any orders that are over $50.00 U.S. dollars for free. Carpet kits, lighting options, windshield tint, exhaust systems, cranks, water pumps, alternators, starters, and transmissions are all available from the online store. Why shop at Auto Parts Warehouse? There are three other reasons to shop Auto Parts Warehouse online. First, they offer the lowest prices and give a guarantee on your purchased parts. Second, they claim to have the largest selection of high end products. High end manufacturer's parts are available with access to names like Moog and Bully Dog. Magnaflow exhaust systems and Marshall engines are a couple more popular brands available. Finally, they have a secure shopping system that guarantees shipments. Auto Parts Warehouse has an enormous selection of auto parts for decades of different vehicles. They have a large inventory of parts and brands to choose from. In order to help customers figure out the potential problems with their autos and find the right auto parts to purchase, Auto Parts Warehouse has a site AutoMD focusing on auto repair. With AutoMD, you can diagnose your car and find the problem quickly by selecting your car details and problem description. Also you can estimate your repair costs with the AutoMD Cost Estimator! 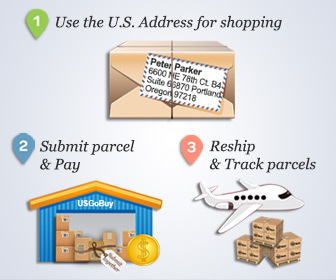 How USGoBuy acts as the mail forwarder for your international shopping at Auto Parts Warehouse? USGoBuy is the reliable mail and package forwarder from USA for your international shopping at Auto Parts Warehouse. With USGoBuy there is no registration fee and you will get a free US shipping address. With that address, you can buy from Auto Parts Warehouse just as the Americans do and have your purchased auto parts shipped to USGoBuy warehouse. After receiving your purchased auto parts, USGoBuy will ship internationally to your address according to your delivery request that you can submit at USGoBuy account. By choosing USGoBuy, you are also enjoying free handling, repacking and consolidation services.